He was the martial arts superstar who put Hong Kong into Hollywood. As thousands of fans prepare to commemorate the 30th anniversary of the death of Bruce Lee, local actor and Lee devotee Stephen Au talks to mathew Scott and Winnie Yeung about the treatment of a local legend. LIKE MANY A Hong Kong lad, Stephen Au Kam-tong walked the streets of the 1970s under the shadow of one man. "He had this special kind of charm that everyone wanted to imitate," explains the 40-year TVB actor. "I was attracted by this charm. And I would try to imitate his moves and his appearance-even the way he talked." The man was, of course, Bruce Lee. And on the eve of the 30th anniversary of the martial-arts master's death - on July 20 - his presence still looms large over the city through which he found his fame. Lee was our first international superstar, a man who counted Hollywood's elite among his friends. His success almost singlehandedly took Hong Kong films into the mainstream along the way. He was the epitome of grace and style and his image still peeks put from posters, T-shirts and other memorabilia on street stalls from SoHo to Saigon. When Lee died - of an acute cerebral edema at the age of just 32 - thousands of Hongkongers lined the streets to pay their respects. For Au, and countless, an obsession with the star that started in childhood has lasted a lifetime. "Bruce Lee is the movie star who brought Hong Kong movies to people all over the world," says Au. "He is the culture of Hong Kong and of Chinese people." To mark the 30th anniversary of his hero's death, Au has developed a 10-episode series, The Legend Of Bruce Lee, with the Kowloon Motor Bus TV channel Roadshow, which began screening yesterday and will run on the almost 10,000 TV's in 2,400 buses and 200 minibuses during the fortnight before the anniversary. The series tours the Hong Kong locales that played an important part in the star's life, including his former home in Kowloon Tong (now a love hotel), and features footage from his film archive, brief interviews with fellow Lee fanatics and the revelation that his first school was actually an all-girls school. The Au-Roadshow production is one of a series of anniversary tributes on both sides of Pacific. Au is negotiating with Broadway Cinematheque in Yau Ma Tei to hold a festival of Lee's films on July 19 and 20 while the Star Movies satellite channel plans to broadcast four of the action hero's movies and two documentaries at 11pm from July 15 to 20. And TVB Jade will screen a commemorative programme on July 19. The largest anniversary event will be the Hong Kong Bruce Lee Fan Club's exhibition of some of the star's belongings and memorabilia at the Pao gallery of the Hong Kong Arts Centre in Wan Chai from July 18 to 27. "I expect more than 10,000 visiting our exhibition," says the club's president. Wong Yiu-keung. "There will be props and special memorabilia that fans might not have been able to see in the past." 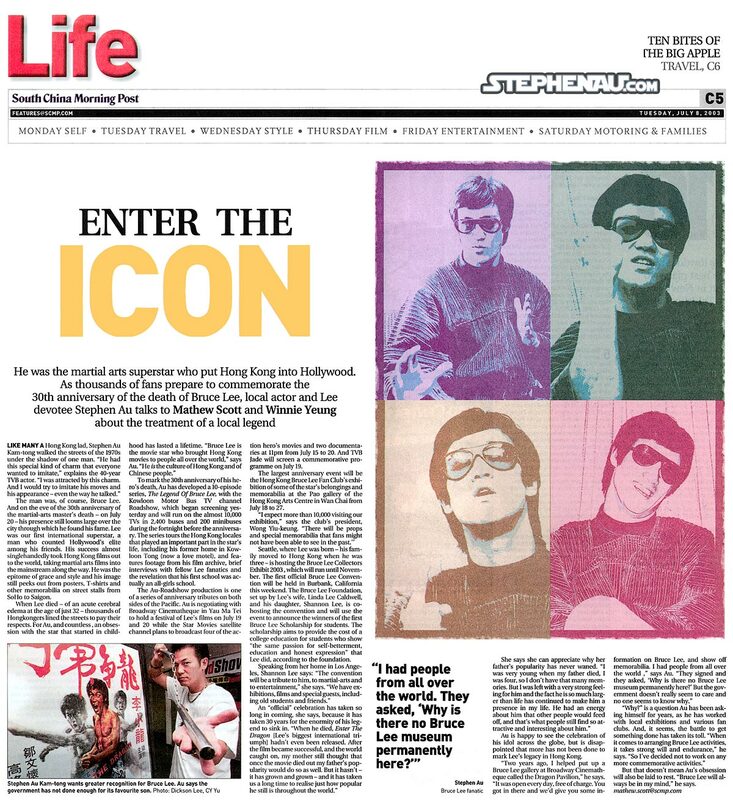 Seattle, where Lee was born - his family moved to Hong Kong when he was three - is hosting the Bruce Lee Collectors Exhibit 2003, which will run until November. The first official Bruce Lee Convention will be held in Burbank, California this weekend. The Bruce Lee Foundation, set up by Lee's wife, Linda Lee Caldwell, and his daughter, Shannon Lee, is co-hosting the convention and will use the event to announce the winners of the first Bruce Lee Scholarship for students. The scholarship aims to provide the cost of a college education for students who show "the same passion for self-betterment, education and honest expression" that Lee did, according to the foundation. Speaking from her home in Los Angels, Shannon Lee says: "The convention will be a tribute to him, to martial-arts and to entertainment," she says. "We have exhibitions, films and special guests, including old students and friends." An "official" celebration has taken so long in coming, she says, because it has taken 30 years for the enormity of his legend to sink in. "When he died, Enter The Dragon (Lee's biggest international triumph) hadn't even been released. After the film became successful, and the world caught on, my mother still thought that once the movie died out my father's popularity would do so as well. But it hasn't - it has grown and grown - and it has taken us a long time to realise just how popular he still is throughout the world." She says she can appreciate why her father's popularity has never wanted. "I was very young when my father died. I was four, so I don't have that many memories. But I was left a very strong feeling from him and the fact he is so much larger than life has continued to make him a presence in my life. He had energy about him that other people would feed off, and that's what people still find so attractive and interesting about him." Au is happy to see the celebration of his idol across the globe, but is disappointed that more has not been done to mark Lee's legacy in Hong Kong. "Two years ago, I helped put up a Bruce Lee gallery at Broadway Cinematheque called the Dragon Pavilion," he says. "It was open every day, free of charge. You got in there and we'd give you some information on Bruce Lee, and show off memorabilia, I had people from all over the world," says Au. "They signed and they asked, 'Why is there no Bruce Lee museum permanently here?' But the government doesn't really seem to care and no one seems to know why." "Why?" is a question Au has been asking himself for years, as he has worked with local exhibitions and various fan clubs. And, it seems, the battle to get something done has taken its toll. "When it comes to arranging Bruce Lee activities, it takes strong will and endurance," he says. "So I've decided not to work on any more commemorative activities." But that doesn't mean Au's obsession will also be laid to rest. "Bruce Lee will always be in my mind," he says. The daughter of Bruce Lee has encouraged the Hong Kong government to establish a permanent tribute to her father, while local fans remain furious that nothing has been done to mark the life and times of our most famous film star. "There really should be something there for him," said Shannon Lee, speaking from her home in Los Angels ahead of the 30th anniversary of Lee's death on July 20. "I haven't ever personally had any discussions with or even been contracted by the government so that is something I'd like to pursue in the future." "One of the goals of (Bruce Lee's) family is to establish a Bruce Lee museum and we are working towards that already. Maybe the Hong Kong government would like to become involved in that." Apart from the unofficial Bruce Lee Cafe on Robinson Road. Mid-Levels, which closed last year, there has never been an attempt in Hong Kong to establish a memorial to Lee, the actor acknowledged as the man who put the Hong Kong film industry on the world map. There is a museum paying tribute to the star and his family in the Daliang district of Shende in Guangdong but this has never been officially recognised by anyone involved with his immediate family. The lack of action by the government has raised the ire of the local Bruce Lee Fan Club, particularly the president and founder, Wong Yiu-keung. Mr Wong, whose club is holding an exhibition at the Arts Centre in Wan Chai to mark the anniversary of Lee's death, said he was "disappointed" by the government. "Maybe they like foreign things so much that they'd pay a lot for things like Disneyland," he said. "But for Bruce Lee, who is unique to Hong Kong, they've decided to do nothing." His view is shared by local actor and Bruce Lee fan Stephen Au Kam-tong, whose series on Bruce Lee is screening on Kowloon Motor Bus TV channel Roadshow. "(Bruce Lee) doesn't concern the Hong Kong government somehow," he said. "Hong Kong is a strange place." Shannon Lee, 34, said it had also taken her family a long time to come to grips with her father's legacy but it had now formed the Bruce Lee Foundation and would this weekend co-host the first official Bruce Lee Convention in Burbank, California. "It has been a long time coming," she said. "But it took time for my mother (Linda Lee Caldwell) to come to terms with just how popular my father still is." "We are just sort of getting things off the ground with the foundation but this (a tribute or museum) is definitely something we'd like to become involved in and hopefully we can start drawing together all the elements from everywhere and with time we can make a bigger presence worldwide and a lasting legacy for him." Although born in Seattle, Lee spent much of his youth in Hong Kong and returned here to begin his film career in his mid 20s. He went on to make 31 films. Lee died of a cerebral edema on July 20, 1973. He was 32 and his most successful film, Enter the Dragon, had yet to be released. A spokesperson for the government's Leisure and Culture Services Department said yesterday that in 1999, the now defunct Urban Council had approved a plan to build a memorial "gallery" for Lee at the Film Archive in Sai Wan Ho but this plan had been shelved due to safety concerns. The spokesperson said there were similar plans for a gallery at an entertainment area planned for the West Kowloon reclarmation complex. This plan has been referred to the Planning and lands Bureau and also the Tourism Commission. The first phase of that project is not due for completion until 2008, the spokesperson said.